"The camp is a no pressure learning environment, allowing participants to focus on what they really want to learn..."
Addressing the need to inspire the best and brightest students to pursue careers in cybersecurity, the Maryland Cybersecurity Center and National CyberWatch Center K-12 Division held a new Cyber Defense Training Camp last week for 28 academically talented high school students from around the country. The Cyber Defense Training Camp seeks to prepare the next generation of cybersecurity professionals through interactive learning, skill building, guest speakers, and field trips. For seven days, participants explored pertinent cyber realms of knowledge and skill sets including cracking passwords, data theft, and spear phishing attacks. "The camp is a no pressure learning environment, allowing participants to focus on what they really want to learn," said Cristin Caparotta, Camp Coordinator and Graduate Assistant with the Maryland Cybersecurity Center. "The students were constantly engaged and excited to learn more through fun activities and challenges." 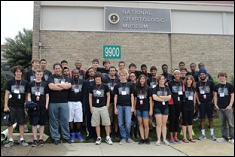 Field trips to and meetings with representatives of the National Security Agency Cryptologic Museum and Lockheed Martin’s NexGen Cyber Innovation and Technology Center (NCITE) exposed the exciting cybersecurity internship opportunities open to the participants in the state of Maryland. Other guest speakers included Diane Miller, Director of Operations for Northrop Grumman’s Cybersecurity Group and Program Director for the CyberPatriot competition; Lindsay Ladd, Information Systems Security Manager at Vistronix and Member of Women’s Society of Cyberjutsu; Amy Ginther, Coordinator of Policy Development and Education, Project NEThics at the University of Maryland; and Alan Paller, Director of Research for the SANS Institute. Living together in a community on campus and interacting with undergraduate cybersecurity students inspired many participants to think seriously about a cybersecurity academic path. Participants were exposed to the numerous University of Maryland cybersecurity programs, including the new Advanced Cybersecurity Experience for Students program, which launches this fall. The Maryland Cybersecurity Center is dedicated to introducing the cybersecurity field to students early on, especially those who are interested in STEM and computer subjects. Camps and workshops are held throughout the year for students of all ages. For more information, please contact Cristin Caparotta at ccapa@umiacs.umd.edu.